A History of Modernist Literature offers a critical overview of modernism in England between the late 1890s and the late 1930s, focusing on the writers, texts, and movements that were especially significant in the development of modernism during these years. 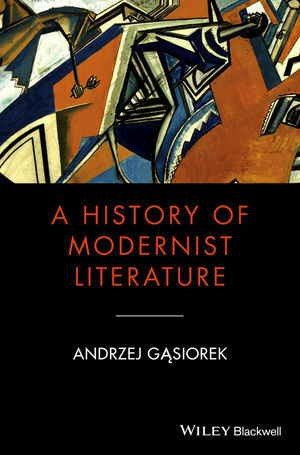 Andrzej Gasiorek is Professor of Twentieth-Century Literature at the University of Birmingham. He is the author of Postwar British Fiction: Realism and After (1995), Wyndham Lewis and Modernism (2003), and J. G. Ballard (2005) and the co-editor of T. E. Hulme and the Question of Modernism (2006), Ford Madox Ford: Literary Networks and Cultural Transformations (2008), The Oxford History of the Novel in English Vol. 4: The Reinvention of the British and Irish Novel 1880-1940 (2010), The Oxford Handbook of Modernisms (2010), and Wyndham Lewis and the Cultures of Modernity (2011). He is also co-editor of the journal Modernist Cultures and editor of the Journal of Wyndham Lewis Studies.